I tend not to make new year’s resolutions (mostly because of my bad habit of breaking them every January 2nd 😉 ), but I did make a goal this year to stay ahead of the game. If we’ve ever met, you know what a lofty goal that is… since I am, above all things, a procrastinator. But I’m doing pretty well so far this year. I’ve already started working on centerpieces for the wedding, and believe it or not, we’ve already wrapped up valentines for Duncan’s class! I came across a pin from Oriental Trading company that I thought would be a fun and easy project that Duncan and I could do together. The best part was I already had most of the supplies lying around the house! 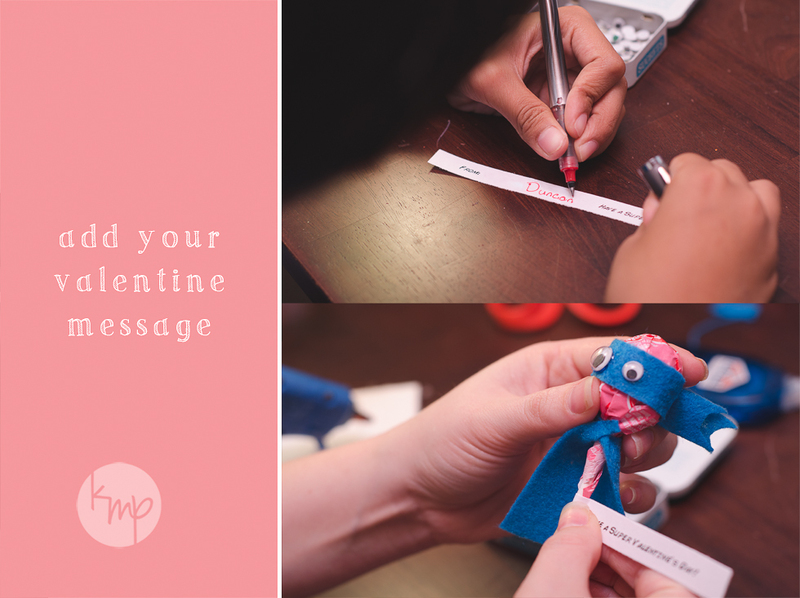 We made our valentines with felt and puff paint, but you could also use paper and markers. 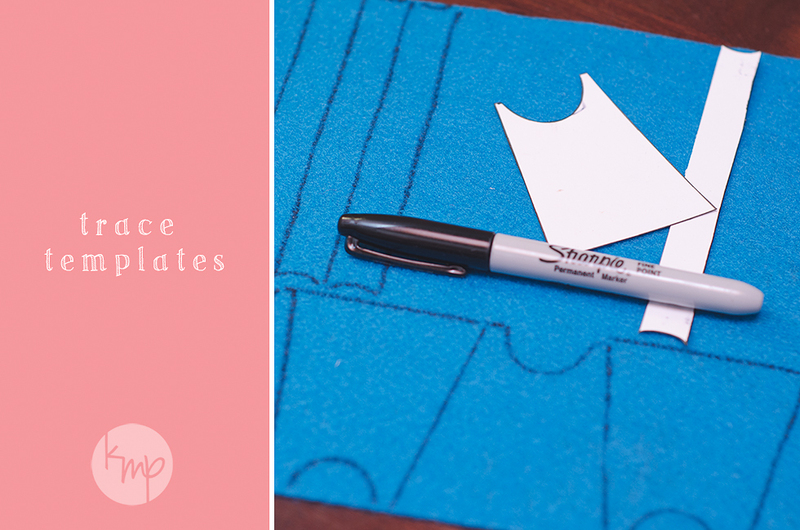 Start by tracing capes and masks onto your felt or paper. Cut your capes and masks. Now for Duncan’s favorite part… puffy paint! 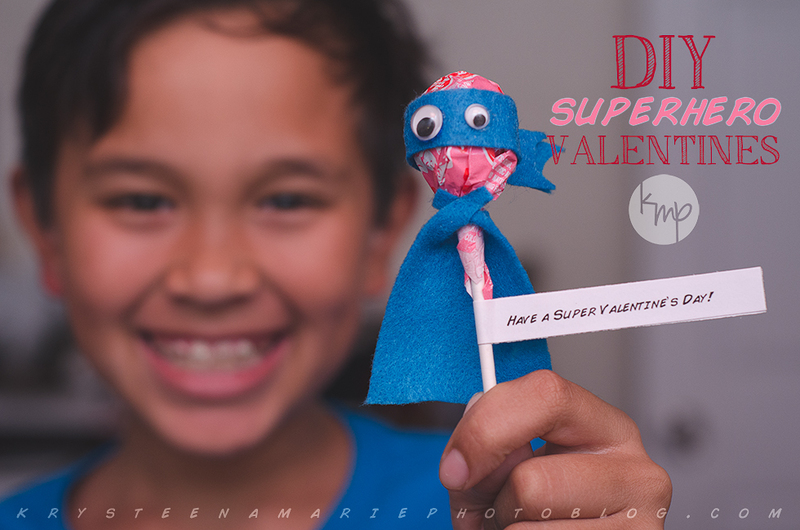 Dunc opted for a “V” in a shield for Super Valentine, but you can decorate them any way you want. Get creative! 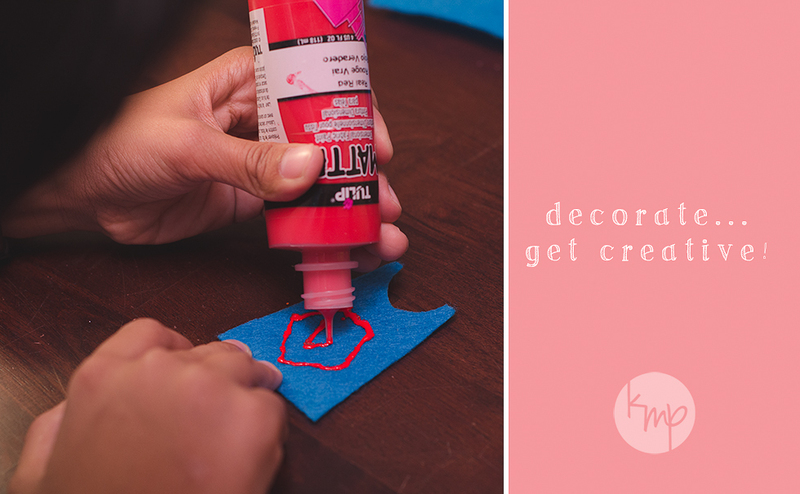 Add glitter, foam hearts, confetti, jewels… whatever you can think of! If you opt for paper capes, break out the markers and go to town! Once your capes are all dry (we waited overnight for the puff paint), it’s time to assemble! 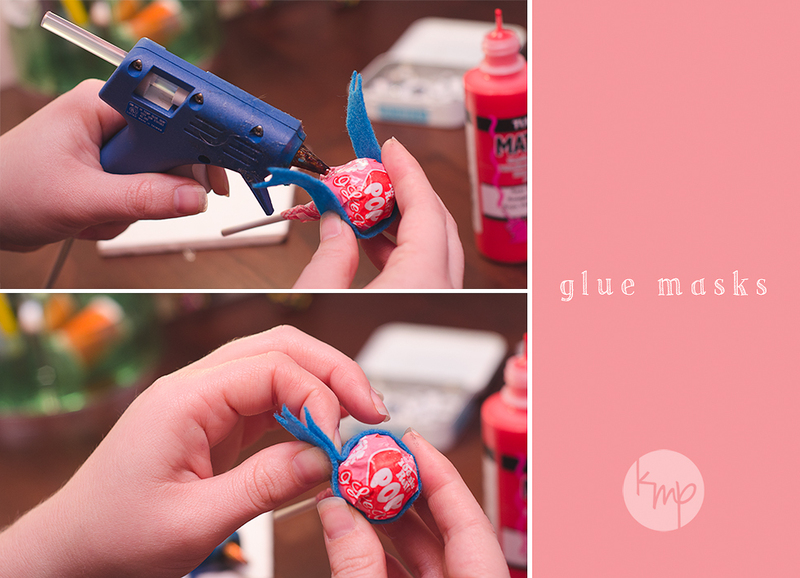 Since we used felt instead of paper, I handled the hot glue gun. If you opt to make paper capes and masks, school glue should work just fine. 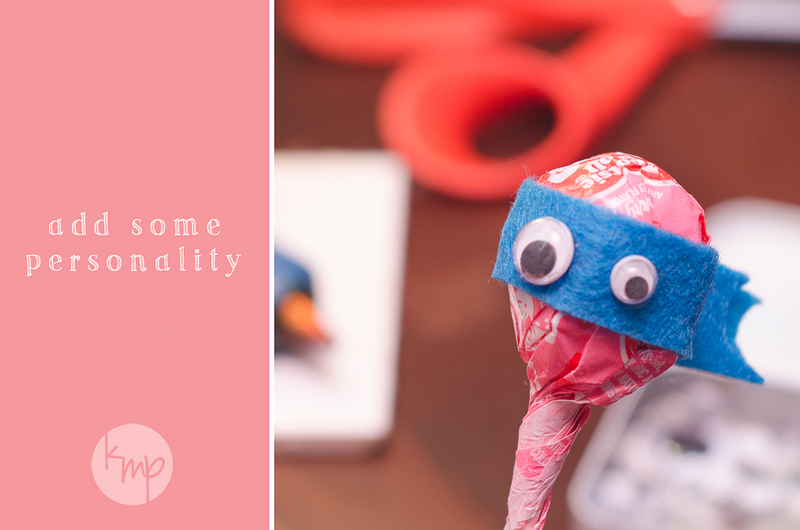 I found that it worked best to glue the mask to the lollipop before gluing the eyeballs on. One dot at the back where the mask comes together was plenty to keep it on. 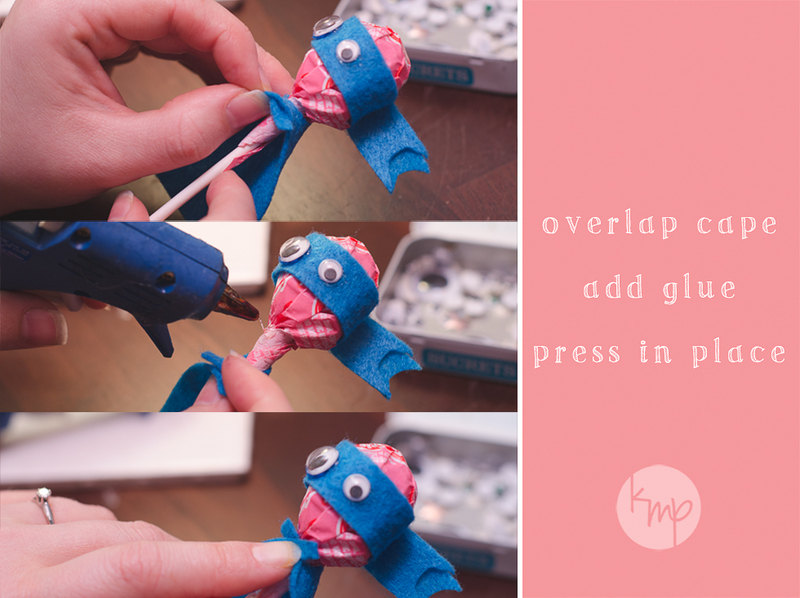 For the cape, I just crossed the two flaps and dabbed a bit of glue on top, and then pressed it upward onto the bottom of the lollipop. 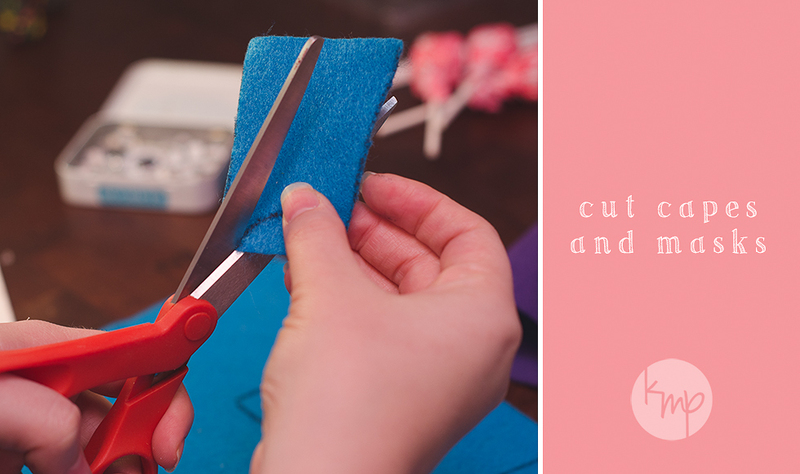 If you make the flaps a bit longer you can tie them in a knot, but I found that gluing was easier and you don’t have to worry about the cape slipping off. The last bit is the valentine message. I typed ours up in a fun comic book font and let Duncan sign each one before cutting. You can download my message template in the supply list above. Then simply fold each strip in half, glue and wrap around stick. I love my dot runner for this part… no sticky mess!